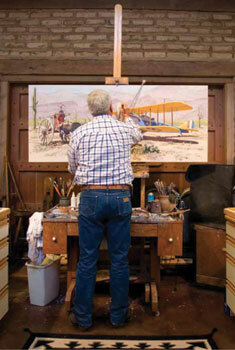 Fred Fellows is equally at home roping, throwing and branding, or creating respected art in his studio. But whichever he decides to do it is a given that he will do it well, because Fred Fellows is cowboy grit and dedicated artist personified. Painter and sculptor Fred Fellows is a man who has always known what he wants. And what he wants is to be a cowboy and an artist. On those points he hasn’t wavered since he was old enough to shave. Fred and his favorite roping horse, Eagle, in front of his authentic style mesquite corral. The ranch’s windmill is visible in the background. Photography by Valerie Hayken Photography and Design. Even after his step-father, mother, brother, and he moved to California in his formative years, Fred never let go of the dream to own a horse. While still in high school, he went to work repairing saddles after classes ended each day. Fellows figured he was on his way to fulfilling one of his dreams—to live the cowboy life. 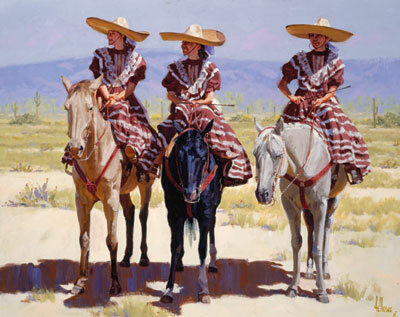 Fred Fellows, The Desert Blooms, La Escaramuza, oil, 30" x 40"
So Fellows continued on the path he’d chosen. “I worked for seven years repairing saddles and finally started to make new ones. Then I served my apprenticeship making new saddles. 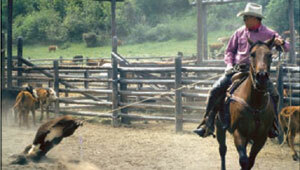 From there I bought a mare and started roping rodeos. Fred displays his championship roping skills. Fred Fellows, Gatherers of Bear Grass, oil on canvas, 26" x 70"
Fellows fell in love with the cowboy life, and it fell in love with him. When an opportunity arose to go north to Monolith, California to work on a ranch, he jumped at it. But being a cowboy was only part of Fred’s dream. But that still didn’t satisfy Fred’s drive to be an artist. “I just really wanted to paint, because it’s easy. So I moved to Taos, ran out of money and had to go back to work at North American Aviation. Fred Fellows, Early Morning Light, oil on canvas, 30" x 70"
Still, Fellows needed to make a living. So he came up with an ingenious way to turn his art and his passion for guns into a profit. “Once a year in Kalispell, Montana they had an antique gun show. Antique gun collectors formed the Montana Antique Gun Collectors Association and once a year they’d have this gun show. And then they’d have a gun show over in Spokane, Washington. And then they’d have a gun show in Salt Lake City, and they’d have a gun show in Denver. The biggest gun show was in Las Vegas. “And so essentially I sold my painting for $140. And then sometimes I’d take a gun home and I’d look it and fix it up—work on it. And I just loved them anyway. And so I built up a small collection of guns. Every once in a while I’d keep one. That’s how I managed to make a living for a while. Fred Fellows, Dependence on Foreign Oil, oil on canvas, 30" x 70"
Fred at work on Dependence on Foreign Oil, his major work for the Cowboy Artists of America Show on October 13-14 at the Phoenix Art Museum, Arizona. Fred Fellows, Horses for the Noon Change, oil on canvas, 26" x 70"
Also in the Fellows collection is a Springfield Carbine that was used at the Custer fight as part of the Battle of the Little Big Horn. Around the same time, Fellows got his first big break. 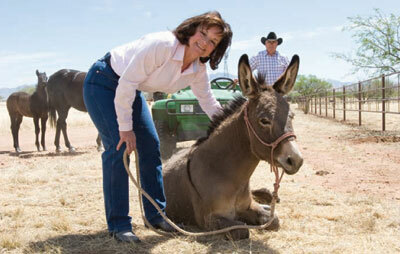 Fred takes a back seat while his sculptor-wife Deborah Copenhaver Fellows, gets their favorite burro, Yum-Yum, to roll over. Shortly thereafter and while he was still trading his paintings for guns, the Cowboy Artists of America (CAA), formed four years earlier, accepted Fellows as a member. The year was 1969. “The whole thing started as a bunch of artists who would get together once a year and go on a ride. It was started as a camp out. Fred is a consummate horseman. That was almost forty years ago, and Fellows has never looked back. Twice he has served as president of the CAA. His artistry has been celebrated throughout the world and his days of trading paintings for guns and barely scraping by are a thing of the distant past. 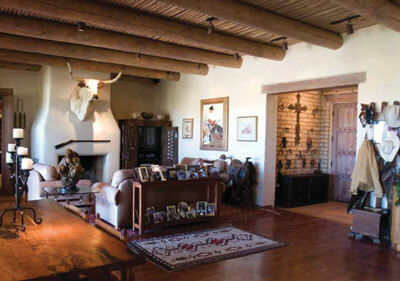 A view of the Fellows’ living room and front entryway from the kitchen. The walkways in the Fellows’ home give a sense of openness and continuity. 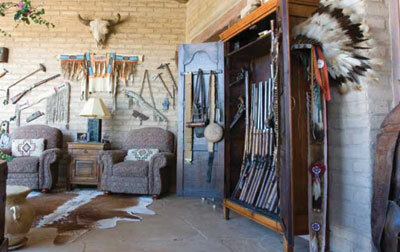 This passageway features a handsome cupboard housing Fred’s extensive antique gun collection. These days Fellows’ paintings and sculptures can be found in museum collections such as the Buffalo Bill Cody Historical Center in Cody, Wyoming, and in private and corporate collections. His list of awards is impressive, and includes the Grumbacker Fine Art award and the Printing Institute of America award. He’s one of a very few artists who have won both gold and silver medals in both painting and sculpture at CAA shows. In fact, he’s won two gold and three silver medals and a Best of Show award. I’ve always wanted to paint an airplane. I was the first one to paint a car or truck for the CAA Show. I believed it was the car or truck that changed the West. A cowboy would have to get up in the morning and ride all day to get to a little old shack on the other side of the ranch. He’d have to stay overnight, check the herd, the cattle, etc. When you have a truck, you could tow a trailer with the horse and have the same thing done in less than a day. If you were going to a rodeo, you had to ride your horse there, and have a tent. It was a rough deal. So the truck and car changed the West completely.” Fellows still lives the cowboy life in southern Arizona with his artist-wife Deborah. Their scenic, working ranch spread boasts horses, some steers, a burro, a dog, and assorted others, along with two studios. 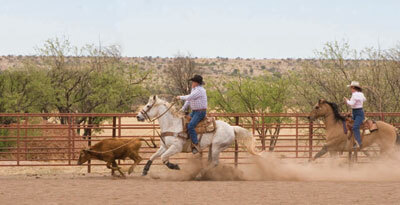 He and his wife continue to rope competitively, and they regularly help with roundups at nearby ranches. The Fellows’ front yard looks out on 74,000 acres that have been designated by Congress as a national conservation easement area and can never be developed. When it comes to living his dreams, Fred Fellows has exactly what he wants. 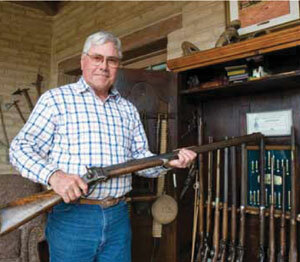 Fred handles one of the many classic rifles, pistols and buffalo guns he has collected over the years. Many of the guns have colorful history, including one specimen used at the Battle of the Little Big Horn. Early in his career, Fred used to exchange paintings for guns, which he later traded for cash. Then he started to repair and eventually build his own collection. 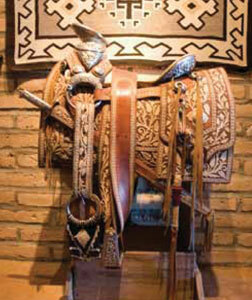 A close-up view of the saddle that once belonged to the governor of Baja, California. 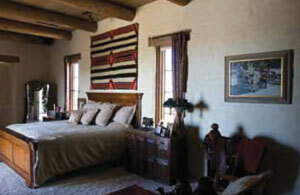 One of the well-appointed bedrooms. Every room in the Fellows’ house gives a sense of Western comfort and is full of art. 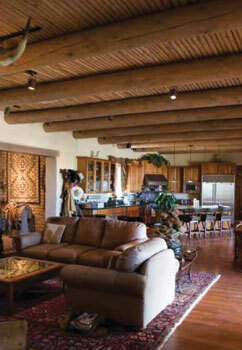 The Fellows’ spacious living room flows into the kitchen.